normsherman wrote: We gotz a winner!! Close one! But Liz kept lead the whole time. Congrats! My astonishment is exceeded only by my humility. DC has the finest stable of artists with which I could ever hope to be associated. I just sent DC a fixed _pretty and unspoiled_ version of the art, so the red splotch can die die die. Horrified at the red blotch on my artwork, I double-checked the assignment email. I was told it was episode #152. If the Fix is in, it ain't by me. Every thing works great using fives! I heart megafauna! Although my heart will always belong to dinosaurs, paleolithic mammals run a close second. Totally, totally skeeved out.This is one of those stories that I made me grip the steering wheel, wince and grimace, and otherwise look like I'm giving birth as I was driving. Awesome, horrible, grimy, adorable... I could feel their dead, dry flesh as I entered the pool. I've started aFaceBook group for writers who want to challenge themselves to writing one story every two weeks for 2011. Lots of chatter and enthusiasm going on over there, so if you want to participate as a writer [or even as a cheerleader!] come over and join up. Ooooh, second that. I read this one to my students every year. It would be nice to have an actual audio production to share with them. This one or his Robot Dreams. The art was extremely well suited. I’ve got all the presents now. All of them, yours and mine. Leaving out the Love Potion on the mantle was a brilliant idea. Topic: Norm keeps us monthly artists sharp and bacon flavored!! Re: Norm keeps us monthly artists sharp and bacon flavored!! All I can add is that I played this episode for my 18 year-old daughter and she's now a DC fan. Matrix and Oceans Eleven gazed lovingly at their offspring and sighed. "We'll call him "Inception," declared Matrix. 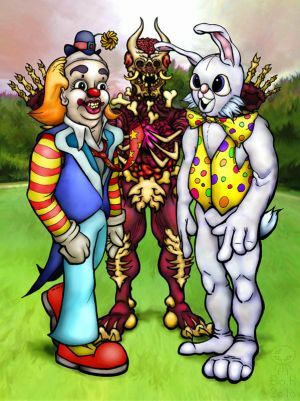 Topic: Clowns & Bunnies: Updates and Soforth. Re: Clowns & Bunnies: Updates and Soforth. Can I be Bo when I grow up? "No sir. Damned reptilians can't conquer squat when sunning themselves on rocks." She held onto her last breath as they pupated. As she slipped into death they hatched and shouted, "Happy Mothra's Day!"